This past weekend, I participated in the inaugural Star Wars Half Marathon Weekend - The Dark Side! I must start this by saying this is a recap coming from a girl who knows nothing about Star Wars, other than distant memories of the original three movies. I learned more about Star Wars than I ever expected and had a wonderful time with friends. 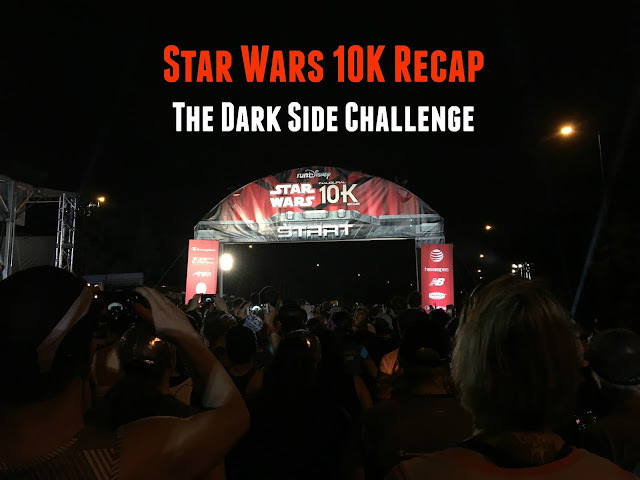 Since this was an inaugural event, I decided to register for the Dark Side Challenge, a 10K on Saturday followed by a Half Marathon on Sunday. My husband and I stayed at Waldorf Bonnet Creek as part of Hilton Bonnet Creek's Marathon Weekends. My friend and ASICS teammate Gelcys (Runner Unleashed) also stayed there so we decided to run this leg of the race together. At 3:20am, my alarm went off and we left Bonnet Creek at 4am. Traffic was surprisingly light and we had about an hour between the time we arrived at Epcot to the time the race started. After saying hi to a few friends and dropping my stuff off at gEAR check, it was time to head off to our Corals. The walk to the Coral was much shorter than the other runDisney 10K which we were both very thankful for. It was about a 5 minute walk from gEAR check and there were a ton of porta potties all within a short distance. I was supposed to be in Coral B but dropped back to stay with Gelcys. Plus I didn't belong in that Coral with my lack of training. This was a very very very humid morning. The race started at 5:30 and we were already hot before our shoes hit the pavement. Mile 1-2 took us through Epcot and a portion of Disney's Boardwalk. Inside of Epcot was one of the longest Character lines I have seen in a while - R2D2. I only wanted two character photos from this weekend - R2D2 and Chewbacca. We decided to skip R2D2 due to the line since Gelcy's already got photo with him. I knew I could take a pic with him the next day since I was running alone. With Gelcys health condition, my priority was to keep her comfortable over that 6.2 miles. We did stop for a globe selfie while in Epcot though. 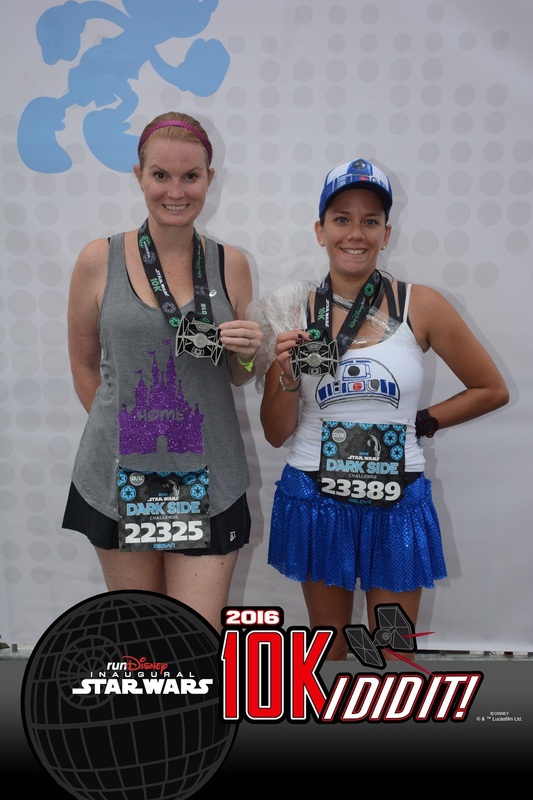 Unlike the other runDisney 10K, the Star Wars 10K took us through the opposite side of the World Showcase, through Canada and the UK. Once we exited Epcot, we saw another giant line - this was for Chewbacca. So I put him on my list for the following day as well. The Star Wars 10K course was very narrow exiting Boardwalk. Then I witnessed the rudest running group to date - a group of very very rude male runners came barging through the left and screaming, "real runners on the left"and pushing into people. I wasn't the only one who witnessed this as another group of friends brought these guys up to me as well. Other than those (insert your favorite rude noun here), everyone on course was polite and I was very happy when we made the turn to go into Hollywood Studios. Yeah, I have no idea what this is other than downright frightful. Sand People and Jawa according to Gelcy's. The entrance of Hollywood Studios was full of character photo opps. It was by far more characters than I had seen on a runDisney course. That thing in the photo above? Yeah, I will have nightmares for years to come. When we got there, maybe 5-10 people max were standing in each line, passing their cell phones to the person behind them for a photo opp. I was happy to see Storm Troopers all around as I knew who/what they are. I did see the latest Star Wars so I wasn't a fan of them for going after BB8. See I do know something! Darth Maul, who is a very scary looking dude. Since I had NO clue who anyone was, other than the storm troopers, I told Gelcys to pick out who she wanted to wait for. That thing above me will give me nightmares for years. You can tell in this pic I didn't want him touching me. A dirty storm trooper and a Jedi of some sort. As you can see in the photos, the sun started to rise when we were taking photos. We spent about 20 minutes taking photos, so we averaged about a 2 minute wait per photo. The photo below was of Boba Fett, who was Gelcys favorite. I couldn't remember his name and tried to explain who he was to my husband. I called him the Iron Man look alike with a giant T on his mask. Once the sun started to peek through, the humidity only got worse. Plus it was very cloudy with rain threatening us all morning. We felt a few drops here and there but thankfully a downpour didn't happen. We exited Hollywood Studios and made the turn towards ESPN Wide World of Sports. Both Gelcys and I have done the Disney World Marathon and have visions of horror every time we enter that complex. That is the longest portion of the full Marathon and it seems to never end. So both of us admitted that this was part of the new course we were least looking forward to. The dreaded entrance of ESPN Wide World of Sports took us both by surprise. We didn't run through the entrance as we were both dreading. Instead, we took a dirt path towards the back. If you have ran Terror of Terror, it is the same as that. I am not a trail runner and we decided to walk the dirt path to avoid my clumsiness. We got into the back side of ESPN and both Gelcys and I had the same thought - please for the love of god, do not make us run in the baseball stadium. We didn't, although we didn't believe it until we were outside of the complex. The course ends by taking you on the outside parking lot of Wide World of Sports. The 6.2 miles were over before we knew it. We collected our 10K medals, got our photos, snack box and collected my bag. This was the first time I have ever done gEAR bag check at Disney and it was so easy. I forgot my race belt in Tampa so I ran this weekend the with bare minimum gear, meaning gear check was a necessity. Moving forward I will always check a bag at runDisney events and I did not miss having a running belt on! Transportation was a different story. My car was at Epcot, where we started the race and we had to be shuttled back. If I could change anything about this course, it would have been to start and end at the same location to avoid the line we had to stand in OR have those driving drop off our car where the finish line is and ship us over in the morning. We waited an hour to get on a bus. I have done both Tower of Terror and Wine Dine Half, where both courses start and end in different locations. Usually, we were on a bus with a very short wait. I loved that we had a new course but crowd frustration was at a high. I tried to outsmart the system and get Uber, but quickly learned that no outside transportation was allowed into the complex. Aside from the fact that I adore Gelcys, there is no way I would have been happier running the Star Wars Dark Side 10K with anyone else. She was so patient with my lack of Star Wars Knowledge. In fact, I jokingly named this weekend the Race Series of "Gelcys, who is that? Gelcys, what is that? Gelcys, how do you spell that". I was able to recognize many of the characters by the end of the weekend (although I have no idea what their history is and had to look at my Instagram to find out their names) and I may have a crush on Storm Troopers! If you aren't already aware of Gelcys story, it is an amazing one. She is a multi-marathoner with double scoliosis and fibromyalgia. Her strength and determination is better than any one I know. So glad there were a lot of characters but booo for the bus lines! I heard complaints from multiple people. Yikes!